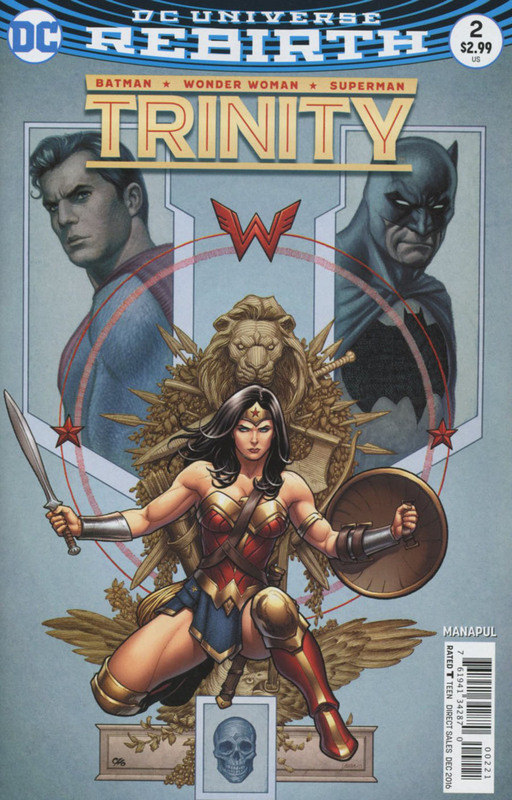 Suddenly Superman, Wonder Woman and Batman are holding the body of Jonathan Kent. A young Clark is terrified to find three strangers apparently causing his father to die. He hurls Clark and Bruce around like rag dolls but when Diana tries to comfort him young Clark remembers that his Pa had told him to run if he was ever in danger. As young Clark races away adult Clark tries to resuscitate Jonathan with Diana's help. Bruce, licking his wounds, worries that they might be damaging the timeline and that they should leave but Jonathan comes to and sees the El shield and panics mistaking Superman for Jor-El he begs for Superman not to take his son away. As morning breaks Lois finds Jon asleep at his window. This is the first night Clark has never come home and Lois reassures him that despite the fight last night and high tension, Clark is now Superman, and always comes home no matter what. Also he, along with Diana and Bruce would never let anything happen to him. Clark find his way to Devil's Mouth Falls and a secret little cavern where he worries that his dad's death is his fault. A ghostly voice echoeing through the cavern offers to help him if young Clark helps it first. Jonathan takes Superman, Wonder Woman and Batman down to the barn's cellar. Pa Kent explained he always feared that Clark would be taken from he and Martha but, no matter what, he was still their son. Time was marching on and young Clark was becoming more super as days went by and he was beginning to ask questions. Diana reassures Jonathan that the Trinity wishes the Kents no harm and that Clark is not the boy's father. Jonathan tells them he had to show young Clark the ship and because of the El shield Superman must have the answers he doesn't. Cramped in their 'halloween costumes' Jonathan takes the Trinity to Devil's Mouth in his pick up truck. While Jonathan and Clark lag behind, bonding in some strange way. Bruce meanwhile whispers to Diana that something isn't right. If they were in the past existence would be changing. Bruce also noticed that Clark seeing Smallville was as if he was seeing something idyllic and new, almost fabricated. Diana tells him she is also searching for Themyscira and if she did she would have the same awe in her eyes. In the meantime Jonathan talks to Clark about fatherhood. About the secrets his family keeps and their inability to give him answers to his questions and what lies in the future. Clark is visibly shaken and can only listen as his father talks. Bruce tracks the boy to the cavern and warns Diana to keep an eye on Superman as the falls have a strange glow to them but she chases him racing to confront a rage filled Kryptonian child. The glow is kryptonite in the falls and adult Clark slumps into the water with only Jonathan to help him. Jonathan pulls Superman out and a tearful Clark tells Jonathan that what he and Martha are doing and will continue to do for years to come is all that young Clark will ever need. The two soaked men look up to see Bruce and Diana cradling a surprised boy. The father and son are reunited and hug while the Trinity watch wondering why the Kryptonite hasn't hurt young Clark. Back in Hamilton County Jon approaches the barn and notices it covered in plant life overnight. The pollen the plants scatter over Jon make him faint and a hooded woman enters the barn revealing herself to be Poison Ivy. The Trinity all have Black Mercy plants on their chests and are in a dreamlike state, but Ivy promises to take care of them while 'He' will take care of them on the mental plane. Story - 4: The story is all about bonding, about fatherhood, about family and now that the Trinity is a new family too. It makes perfect sense to follow it up. The scenes with Jonathan Kent are gold. Heartstring tugging, powerful and with aspects we've not seen before. The other story element is fear, fear of loss and the currents are felt throughout. In the New 52 they avoided Clark, his past and his family, so it's nice that even in a fantasy that we are exploring it. The jump to scenes with Lois and Jon were equally as touching, but I resonated more with Jonathan Kent Sr. I wasn't aware that Poison Ivy knew Clark was Superman and had a son. Nor that she didn't recognize Bruce Wayne. I'm not talking about the mental plane but the beginning & ending seems to be a bit fast and loose so I wasn't sure. The story is still in progress so I'll wait and see, but I'm really enjoying it so far. It doesn't feel canonical yet but it's still early days. Art - 5: There is a lot of innovation in the layouts and a frenetic style that is very enjoyable. The art is a tad confusing to follow sometimes because it is such a departure from the norm. Perhaps it's because I'm getting old but it took a second read through to figure the finer details of the opening scene and the Ivy one. I would like the art to breathe a little more, be a tiny bit slower in pace just to let the book feel more rounded. 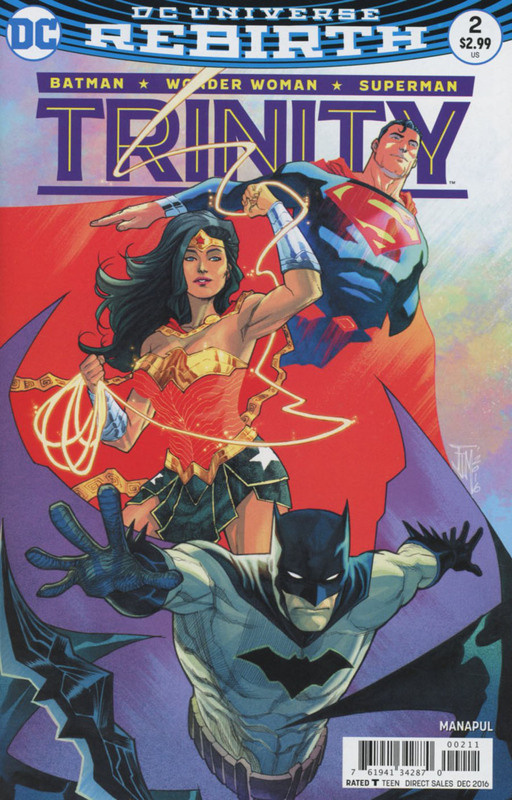 Cover Art - 5: Seeing the Trinity together never gets old and these color themed ones have a certain appeal I had never really thought of. I had not realized how natural the flow of the palette is between the three heroes, or at least it hasn't been capitalized upon till Manapul experimented with the blend technique. Variant Cover Art - 4: I've never really had an issue with Frank Cho and his art and indeed this cover is a thing of beauty. Considering the story is a Clark-centric one it is an odd choice of variant to have as it offers nothing to the reader in relation to the story. As the cover is so nicely done, it is a shame it is so distanced from the story as it then leads you to the feeling of 'what if'.